The Donald Trump market rally could face headwinds from two key undertows that have the potential to hold back the U.S. economy next year. Since the election, the dollar is getting stronger and interest rates have risen dramatically. 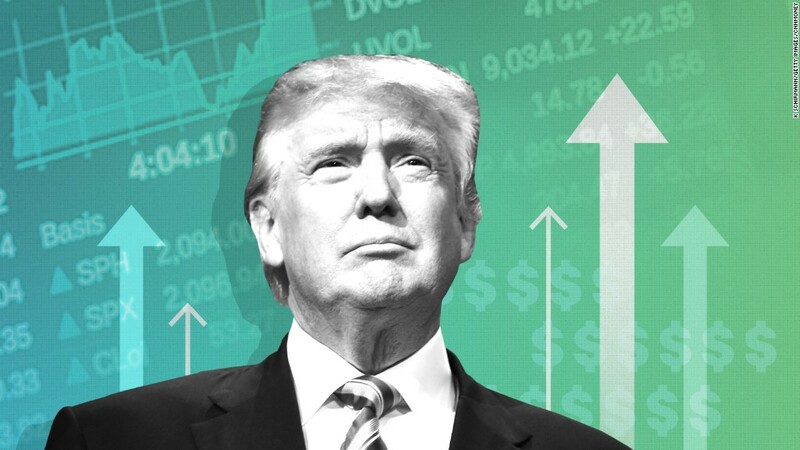 Both of these forces could end up throwing cold water on the Trump-led economic renaissance that investors are betting on which has sent the Dow to an all-time high. Trump has promised to ramp up manufacturing jobs, government spending and grow the economy at 4% per year. But higher interest rates will increase the cost of borrowing for all Americans, especially those who want to buy houses and cars. The U.S. government's 10-year Treasury note rate has jumped to 2.35% from 1.8% prior to the election. And the dollar's value hit a 13-year high recently, rising about 4% against the world's most popular currencies just in the past three weeks. A strong dollar will be a challenge for U.S. manufacturers because it makes America's exports, such as cars, more expensive and less attractive to foreign buyers. "The stronger dollar is going to hurt U.S. manufacturers," says Christopher Rogers, research analyst at Panjiva, a firm that tracks global trade data. One reason that interest rates on U.S. bonds are spiking is because investors believe Trump's massive infrastructure-spending plans will add to America's already-massive debt load. America cannot afford all of that spending, says JPMorgan chief global strategist David Kelly. The Tax Policy Center forecasts that Trump's plans would push U.S. debt to soar to 143% of GDP by 2026 compared to 104% today. "The truth is boosting the federal debt to these levels is fiscally reckless," Kelly wrote in a research note. Increased spending could cause inflation to rise faster, which would cause interest rates to go up more too. It would also make America's debt less of a safe haven for global investors. Higher risk can push up rates too. Rates are also rising because many anticipate the Federal Reserve will hike interest rates next month for the first time in a year. And if Trump's policies end up causing growth and inflation to tick up, it could cause the Fed to raise rates faster than previously planned. The dollar's rise since the election stems from the hope of better economic growth under a Trump administration and more Fed rate hikes. Trump's promise to bring back more manufacturing jobs is a challenge not only because of the strong dollar but also by another reality: technology. It takes fewer workers to make just as many goods today, experts say. For decades, jobs in the manufacturing sector have been shrinking. There were 53,000 fewer U.S. manufacturing jobs in October compared to a year ago. That trend won't reverse quickly or meaningfully anytime soon, experts say. "Don't expect much growth in manufacturing jobs going forward," says Jim O'Sullivan, chief U.S. economist at High Frequency Economics, a research firm. "There's no signs that we're going to get manufacturing booming by any means." Against the backdrop of a strong dollar and more expensive borrowing, Trump's big campaign promises could hit a cool reality come January, some say. "The prospects for tax cuts and additional government spending -- there may be more optimism there than reality may provide," says Russell Price, chief U.S. economist at Ameriprise Financial.